Without our fantastic crew chiefs and ground support teams, none of this helicopter flying in Vietnam could ever have happened. Our crew chiefs flew all day with us, loading and unloading cargo and passengers, putting their lives in our pilots’ hands hour after hour, day after day (some nights), landing after landing. Without them the machines would have deteriorated to un-flyable junk in less than a week. After working all day in the air, they many times worked all night to maintain the helicopters. Sometimes they had to wash blood off the cabin floor and sweep our maggots from dead marines. They changes out engines overnight, replaced gear boxes, rotor blades and many other components--in the field at times. They filled about 100 zerk fitting with grease, most of them every night; there must be 50 zerk fitting on the H-34 rotor head alone. They did all the refueling whenever we stopped to refuel. These were the most dedicated crews that could possibly have existed, anywhere, anytime, any war. They never got enough thanks and credit for their sacrifices. Thank you crew chiefs, gunners mechanics, avionics and armory personnel. so far I have had seven five-star reviews. H-34 Charlie has had a busy summer. military gear to about 1100 veterans, and fed almost 700 free meals for the attendees. It was a dreary day with a light rain falling, but a little moisture did not deter the veterans. Here is a picture of Charlie at the "receiving" line. The Marine Corps League had a recruiting tent next to Charlie. We made some new friends but did not recruit one new member. Our local VFW post No. 2453 managed the Stand Down, and Marine Corps League Detachment #1110 provided the tasty food. Chapter 890 of the Vietnam Veterans of America provided much of the funding for this event. GREAT JOB, GUYS! Good working together. This is our big veteran event for the year, and is always greatly anticipated. We have a lot of veterans here in Northern Idaho who pretty much hide out in the woods most of the time and they do not come into town often. They tend to be poor, so it is a nice thing to have a place where they can get boots, cold-weather gear and sleeping bags. Our winters here can get very cold. Here is Charlie pre-positioning at the fairgrounds the night before. Marine Corps League member and former Commandant Everett Wood has become our most experienced tow-meister. That did not prevent a minor tree-strike on the way home from the 4th of July parade! more on that next post. After the Stand Down Charlie returned to her nest at the NORTHWEST AUTO BODY storage area on GN road, out behind Sandpoint airport (SZT, for you aviators out there). if you need any kind of auto body work or windshield repair NORTHWEST is your place to go. With their new facility out in Ponderay, it is even more convenient to use their courteous, professional shops to have your auto body and windshield needs met. If you use them, please be kind enough to say to them that you appreciate their generosity for letting Charlie live in their storage yard for free. 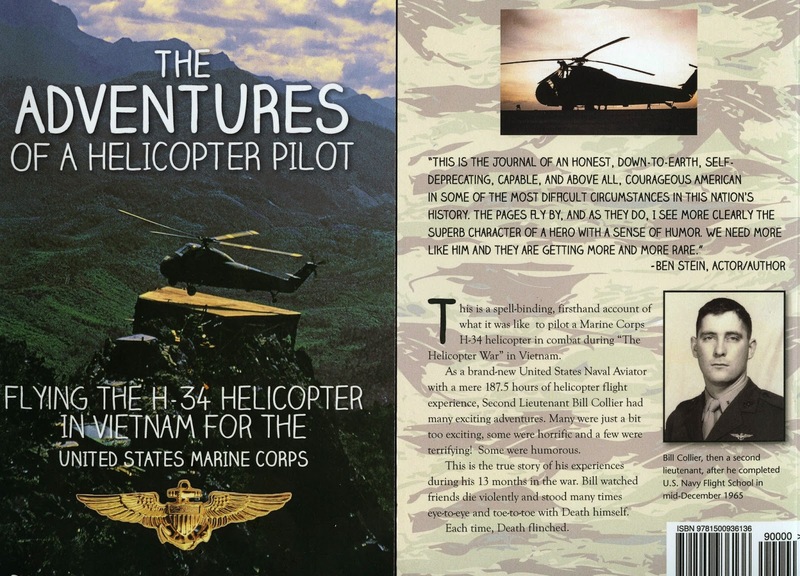 "Flying the H-34 in Vietnam for the United States Marine Corps." I will be posting asap when it is available on Amazon Books. SOON! Elephants graze just off the end of the runway at Khe Sanh Airport, Fall of 1966. Here are two of the pictures that go with yesterday's post, "Enemy Helicopters." There is one more-an aerial shot of Khe Sanh airport. I will keep trying to figure out this insane system. This is NOT the very same Vietnamese Airforce H-34 "Butterfly" mentioned in my story. This was taken somewhere near the coast in flat terrain.